Discussion in 'vBench (Works in Progress)' started by KenBoyle, Sep 13, 2017. 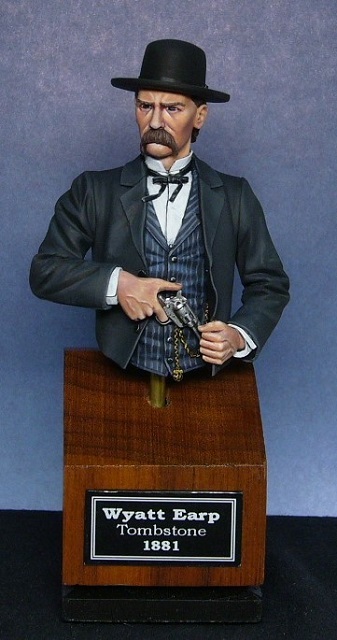 Well I decided, once again, to go for a diversion from my normal 54mm/90mm figures and visit the world of Busts/Half figures. I dedicate this one to Nap since it has no legs. 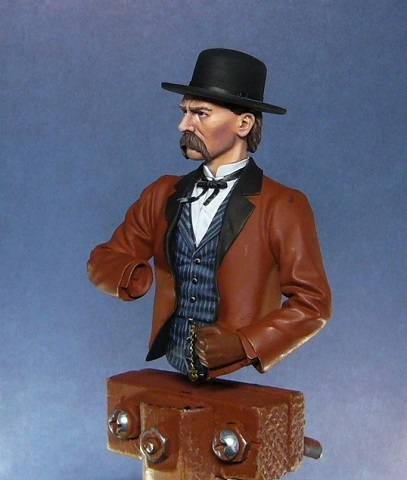 Sticking to my current 1800's Western theme, I pulled this oldie but goodie from my stash of figures. 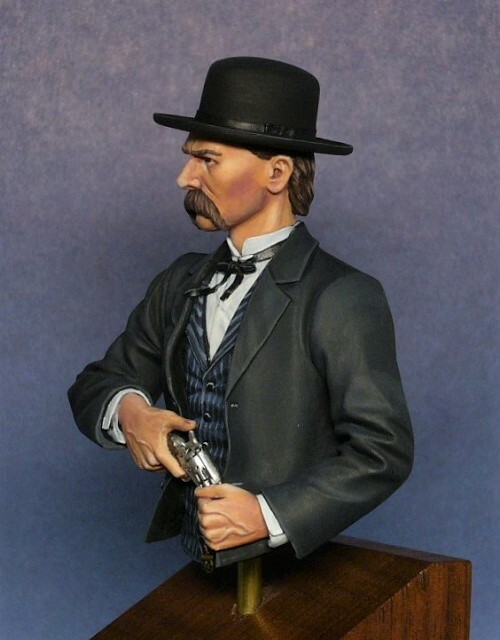 It is a Wyatt Earp Half Figure sculpted by Mike Good for Jaguar. I primed it several years ago and never did anything else. I guess, at Nap's urging, it's time to revisit it. Maciej, Borek, Mjølner and 9 others like this. Following with interest Ken, watched the wild West series on TV directed by Paul Newman. 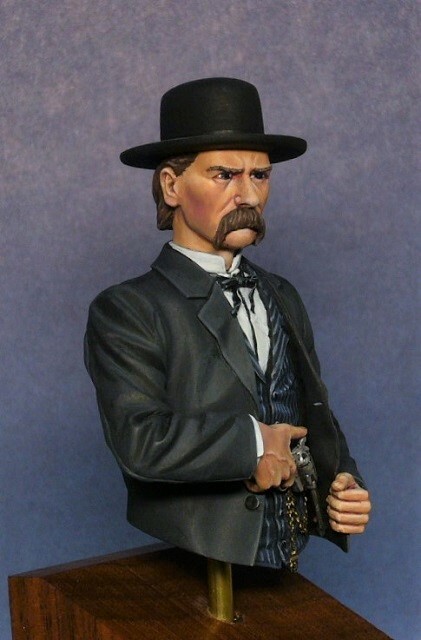 Very interesting with the piece on Wyatt Earp. You could always paint a pin stripe vest. Once had this ...wish I still had ! KenBoyle and Viking Bob like this. Slow getting started Ken but a nice start Mate. 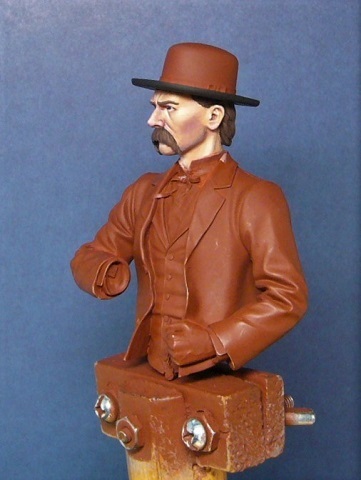 A fine piece from Mike with an open book of possibilities on how to bring Him to life. I am looking forward to following your progress knowing you will make a great job of it. KenBoyle, napoleonpeart and Viking Bob like this. Thanks Bob! Your idea on the vest is very good. I'll give it a try and see if I can pull it off. Lots of "straight" lines right next to each other sounds like a real challenge. Thanks Nap! I'm enjoying the larger figure for a change, just like I enjoyed the smaller ones. After viewing your "Bust" threads and those of others, I got the bug. That's part of the reason I enjoy "Planet Figure". Seeing all the different works makes me want to paint. Even though, as in this case, it's taken me a couple of years to dive back in. Viking Bob and napoleonpeart like this. Thanks Keith! It would be nice to finish Wyatt after all this time. Moving him from my workbench to the "completed" cabinet will be a treat. Wings5797 and Viking Bob like this. Looking forward to this Ken . Ken, one of my favorite busts by Mike Good. I too have contemplated painting this one, but backed off due to color combinations. 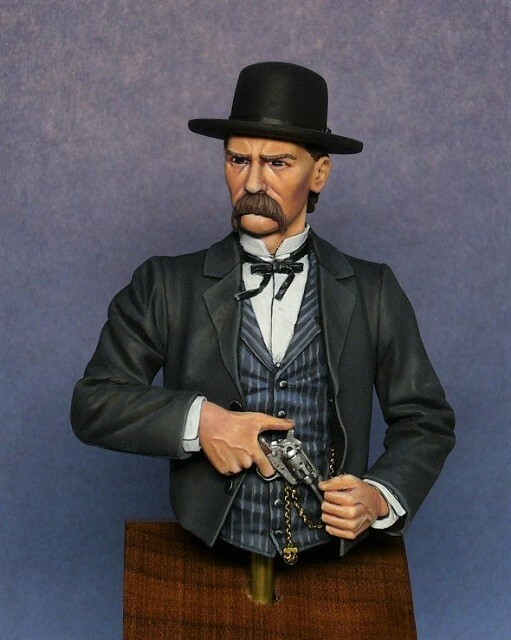 Yet, they did dress like "grave diggers"
in Tombstone...Curious to see what you come up with! Always enjoy seeing your work. Hope you make it to Atlanta Show one year soon! Thanks Ralph! I'm interested in finishing him sooner than later. So maybe in the next day or so. Retirement is a benefit after all. swralph and napoleonpeart like this. Well, thank you Bob! Great idea on the vest. I went online and searched for different period vests and found one I liked. Because there is so much black on the figure, I decided to break it up a bit with a subdued blue gray color vest. This fits him well, I think, because it's stylish without being too flashy. As if blue jeans and tee shirt Boyle knows what he's talking about. I still need to paint the Duster Jacket, hands and pistol. Hopefully tomorrow. Borek, Scotty, phil_h and 5 others like this. That's looking good Ken, are you sure it's a duster and not a frock coat he is wearing. Viking Bob and KenBoyle like this. Good question, since we can't see the whole coat. Typically, by definition, Frock coats only come down to the knees, while Dusters go all the way to the ankles. 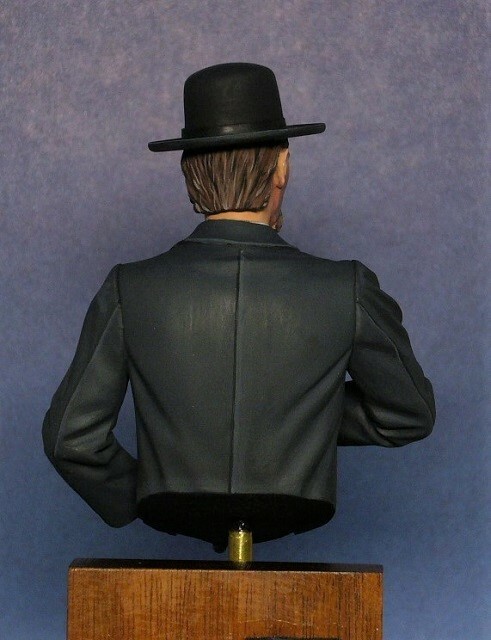 However, there is a "Long Frock Coat" that goes to the ankles. 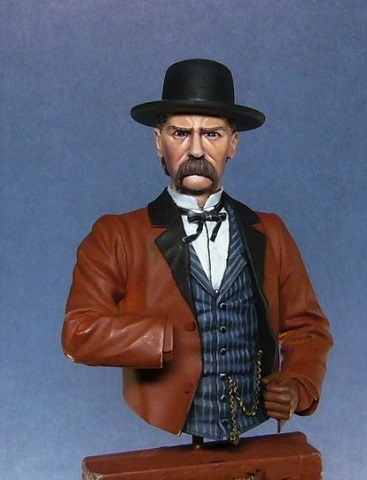 I've seen drawings and movie stills of Earp in both types of coats. Your guess is as good as mine. Thanks Nap! Finished the coat last night. Working on the hands and pistol later today. Got to go post on my fashion blog for a while, see you later. swralph and Viking Bob like this. Ken, I would say, you nailed it with the pinstripe vest. Great job! 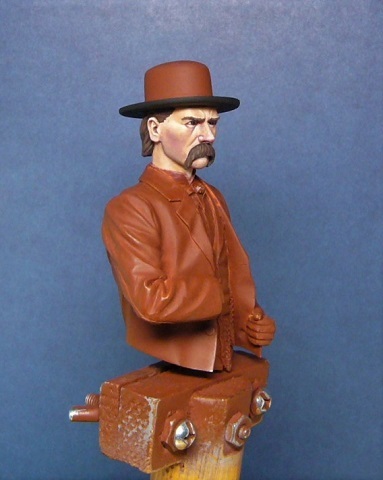 Good choice of colors for your Marshall Wyatt Earp. Thanks for sharing! Haven't done a bust in a long, long time. Now, I'm hooked and I'm sure I'll be working on several others in the months to come. 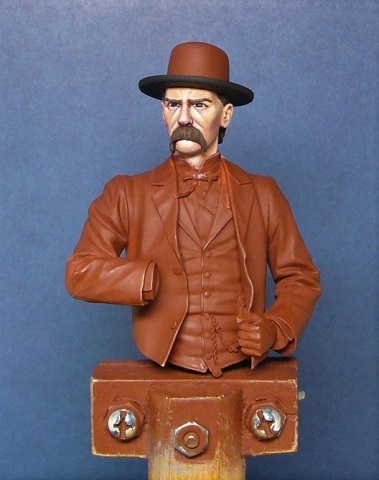 Well, Wyatt is finished and ready for the display cabinet! One less on the workbench. Borek, arj, swralph and 9 others like this.